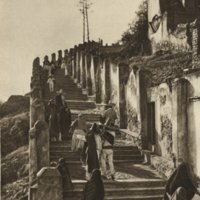 This photograph, taken in the mid-1920s, shows worshippers visiting the shrine of the Virgin of Guadalupe, at the edge of Mexico City. The stairs they climb link the chapel of the Indians to chapel of Tepeyac. 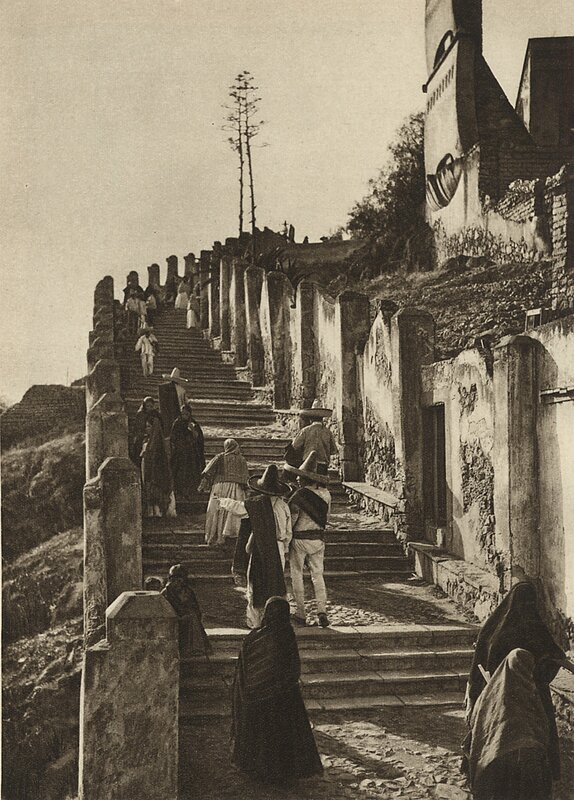 The stairs lead to the site where Juan Diego was believed to have his vision of the Virgin of Guadalupe. His cloak, which bears the Virgin’s miraculous image, was housed at the 18th century basilica at the foot of the hill and can be seen in Vistas. At the upper right of the photograph are permanent versions of the sails that sailors, who believed the Virgin had saved them from a storm, had erected. Creoles in Mexico City championed worship of the Virgin of Guadalupe as early as the 17th century. Both before and after, because of various connections to indigenous worship, the Virgin also inspired devotion from popular classes. Brading, D. A., 2001. Mexican Phoenix: Our Lady of Guadalupe: Image and Tradition Across Five Centuries. Cambridge: Cambridge University Press. Peterson, Jeanette. 2014. Visualizing Guadalupe: from Black Madonna to Queen of the Americas. Austin: University of Texas Press. Taylor, William B. 2016. Theater of a Thousand Wonders: a History of Miraculous Images and Shrines in New Spain. Berkelely: University of California Press.